What is Beta in Finance? 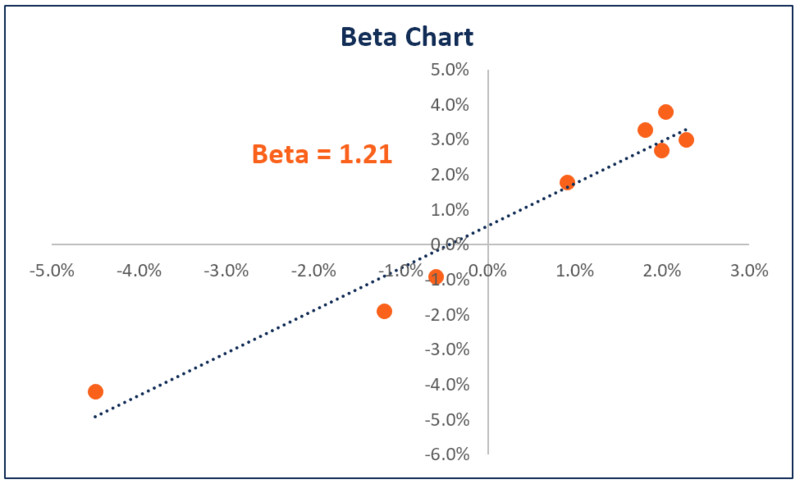 The beta (β) of an investment security (i.e. a stock) is a measurement of its volatility of returns relative to the entire market. It is used as a measure of risk and is an integral part of the Capital Asset Pricing Model (CAPMCapital Asset Pricing Model (CAPM)The Capital Asset Pricing Model (CAPM) is a model that describes the relationship between expected return and risk of a security. CAPM formula shows the return of a security is equal to the risk-free return plus a risk premium, based on the beta of that security). A company with a higher beta has greater risk and also greater expected returns. High β – A company with a β that’s greater than 1 is more volatile than the market. For example, a high-risk technology company with a β of 1.75 would have returned 175% of what the market return in a given period (typically measured weekly). Low β – A company with a β that’s lower than 1 is less volatile than the whole market. As an example, consider an electric utility company with a β of 0.45, which would have returned only 45% of what the market returned in a given period. Below is an Excel β calculator that you can download and use to calculate β on your own. β can easily be calculated in Excel using the Slope function. What are Equity Beta and Asset Beta? Levered beta, also known as equity beta or stock beta, is the volatility of returns for a stock taking into account the impact of the company’s leverage from its capital structure. It compares the volatility (risk) of a levered company to the risk of the market. Levered beta includes both business riskSystemic RiskSystemic risk can be defined as the risk associated with the collapse or failure of a company, industry, financial institution or an entire economy. It is the risk of a major failure of a financial system, whereby a crisis occurs when providers of capital lose trust in the users of capital and the risk that comes from taking on debtMarket Value of DebtThe Market Value of Debt refers to the market price investors would be willing to buy a company's debt at, which differs from the book value on the balance sheet. A company’s debt isn't always publicly traded bonds, which have a specified market value. Companies own debt that can be classified as non-traded. It is also commonly referred to as “equity beta” because it is the volatility of an equity based on its capital structureCapital StructureCapital Structure refers to the amount of debt and/or equity employed by a firm to fund its operations and finance its assets. The structure is typically expressed as a debt-to-equity or debt-to-capital ratio. Debt and equity capital are used to fund a business’ operations, capital expenditures, acquisitions,. Asset beta, or unlevered betaUnlevered Beta / Asset BetaUnlevered Beta (Asset Beta) is the volatility of returns for a business, without considering its financial leverage. It only takes into account its assets. It compares the risk of an unlevered company to the risk of the market. It is calculated by taking equity beta and dividing it by 1 plus tax adjusted debt to equity, on the other hand, only shows the risk of an unlevered company relative to the market. It includes business risk but does not include leverage risk. Levered beta (equity beta) is a measurement that compares the volatility of returns a company’s stock against those of the broader market. In other words, it is a measure of risk and it includes the impact of a company’s capital structure and leverage. Equity beta allows investors to assess how sensitive a security might be to macro-market risks. For example, a company with a β of 1.5 denotes returns that are 150% as volatile as the market it is being compared to. When you look up a company’s beta on Bloomberg, the default number you see is levered, and it reflects the debt of that company. Since each company’s capital structure is different, an analyst will often want to look at how “risky” the assets of a company are regardless of the percentage of its debt or equity funding. The higher a company’s debt or leverage, the more earnings from the company that are committed to servicing the debt. As a company adds more debt, the uncertainty of the company’s future earnings also rises. It increases the risk associated with the company’s stock, but it is not a result of the market or industry risk. Therefore, by removing the financial leverage (debt impact), the unlevered beta can capture the risk of the company’s assets only. There are two ways to estimate the levered beta of a stock. The first and simplest way is to use the company’s historical β or just select the company’s beta from Bloomberg. The second and more popular way is to make a new estimate for β using public company comparables. To use the comparables approach, the β of comparable companies is taken from Bloomberg and the unlevered beta for each company is calculated. Levered beta includes both business risk and the risk that comes from taking on debt. However, since different firms have different capital structures, unlevered beta is calculated to remove additional risk from debt in order to view pure business risk. The average of the unlevered betas is then calculated and re-levered based on the capital structure of the company that is being valued. Note: In most cases, the firm’s current capital structure is used when β is re-levered. However, if there is information that the firm’s capital structure might change in the future, then β would be re-levered using the firm’s target capital structure. A security’s β should only be used when its high R-squared value is higher than the benchmark. 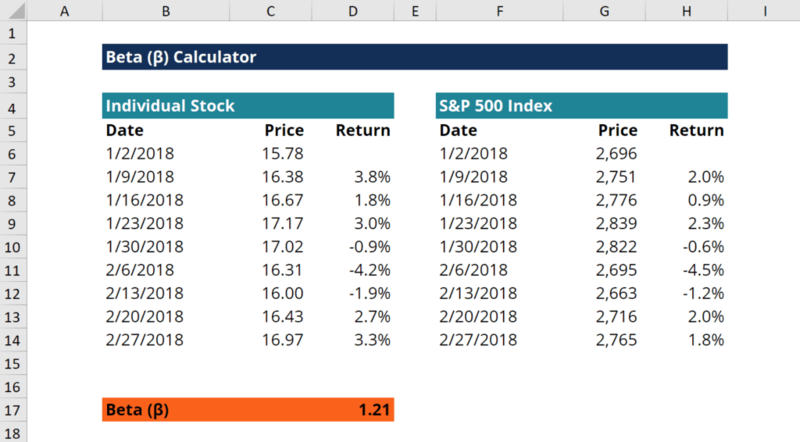 The R-squared value measures the percentage of variation in the share price of a security that can be explained by movements in the benchmark index. For example, a gold ETF will show a low β and R-squared in relation to a benchmark equity index as gold is negatively correlated with equities. A β of 1 indicates that the price of a security moves with the market. A β of less than 1 indicates that the security is less volatile than the market as a whole. Similarly, a β of more than 1 indicates that the security is more volatile than the market as a whole. Companies in certain industries tend to achieve a higher β than companies in other industries. For example, the β of most technology companies tends to be higher than 1. Also, a company with a β of 1.30 is theoretically 30% more volatile than the market. Similarly, a company with a β 0f 0.79 is theoretically 21% less volatile than the market. For a company with a negative β, it means that it moves in the opposite direction of the market. Theoretically this is possible, however, it is extremely rare to find a stock with a negative β.